The Parthian Empire (which lasted from 247 BC to 224 AD),was a powerful middle eastern Empire. 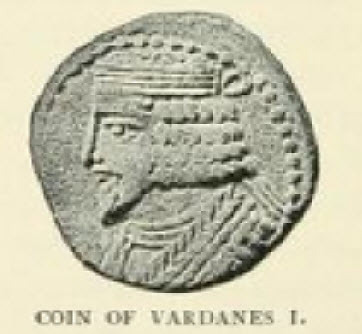 At its height, the Parthian Empire included most of present day Iran, Iraq, Afghanistan, and parts of Turkey and Syria, and the Gulf States and sections of eastern Saudi Arabia. Wealthy and expansionist, the Parthian Empire soon came into conflict with the expanding Roman Republic and the two empires fought several wars in the Middle East. An attempt by the Romans to conquer the Parthian provinces in modern Iraq was soundly defeated when the Roman army under Crassus was crushed at the Battle of Carrhae. This was followed by a Parthian attempt to conquer most of the Levant area, namely modern day Syria, Turkey, Lebanon, Israel and Jordan. The Parthian advance was initially successful but was eventually beaten back by Roman Legions commanded by Mark Anthony. Eventually the two great powers settled into an uneasy peace marked by occasional conflicts and proxy wars involving client states, particularly the Kingdom of Armenia.This peace was broken by occasional wars over the centuries, some of which ended in Roman successes while at times Rome was the victor. Neither side was able to conclusively defeat the other. Internal strife eventually led to the fall of the Parthian Empire around 224 AD, which was replaced by the Sassanian Empire. This empire would continue to be a thorn in Rome's side for about 400 years. In the Byzantine-Sassanian war of 602-628 AD, the Sassanians successfully invaded the eastern Roman Empire and conquered Syria, Lebanon, Egypt, and much of Turkey. They were beaten back by the Romans but the war left the Roman empire exhausted and easy prey to the invading Muslim armies who invaded in their turn shortly thereafter. It can be said that the Parthian Empire played a pivotal role in the history of the Roman Empire as well as the world; first by stopping the Roman Empire's eastern expansion, secondly by tying down much of its military strength which could have been used instead on the German frontier, and finally by weakening the empire and paving the way for the Muslim conquest.